One of the most common mistakes we can make in the pursuit of happiness is to work on the emotional and spiritual part of ourselves first. You might think it makes sense to spend time working on emotions and attitude when searching for a peaceful and happy state of mind – after all, that’s where the problem lies, right? True. However, when you go directly at the emotional or spiritual side first without the mechanics in place, it’s like trying to fix an engine without basic tools. 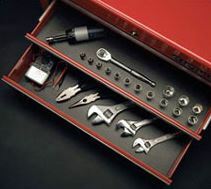 The tools come from working the mechanics first – the boring methodical stuff. Responsibility. Discipline. Goals. Habits. We need to do things like take total blame for exactly where we are in life and how we feel. No more luck, karma, superstition, fate or tea leaves. Not now. Maybe something to explore later, when we’ve learned how to effectively manage money to support our chosen lifestyle. Maybe after we’ve stopped procrastinating and putting off the most important things on our list day after day. How about we look to spirituality after we’ve quit physically harming our own physical body through poor diet or lifestyle choices. I think we can agree that in the pursuit of happiness it’s probably best to first stop making simple errors in judgement day after day before we ask ‘the fates’ why we’re not happy. Fair? A mindset of total ownership of, and blame for, everything in your life. The ability to make yourself do what you know you should do, whether you feel like doing it or not. A reason for going forward, a goal, belief or motivation strong enough to pull you forward. Removal of bad habits, creation of better ones. This is simply how life works for us human beings on this particular planet, in our lifetime. We have to first have control of our basic behaviors and attitudes before we can hope to experience overarching things like “happiness in life”. Makes sense, doesn’t it? Happiness comes from feeling okay about what we’re experiencing in life, and if we have no control over that experience or don’t know how to shape the experiences we desire, then how can we be happy? We can’t. You won’t. Pretty simply put. Before you feel happy, you have to do things that will create happiness. There are no shortcuts to lasting happiness or success. Play by the rules, you get the results you desire. Make up your own rules, you don’t. Astonishingly simple, totally misunderstood by most, and therefore enormously powerful when you are able to ‘get it’. The boring, difficult, tedious things have to come first. Put some money in the bank. Learn how to be more efficient and effective. Overcome procrastination. Identify and set goals. Do some planning. Do some maintenance. Make lists and take actions. Improve your job and life skills. Learn things. Exercise. Eat well. That’s how you start down the path to happiness – from learning the mechanics necessary to create improved results and experiences.